The first recorded bridge spanning the Coosa River at Wetumpka was built in 1830. No account is available as to the fate of this bridge, but the next known bridge construction occurred in 1834. In accordance with an Act passed by Legislature in 1834, toll bridge companies were allowed to be formed. 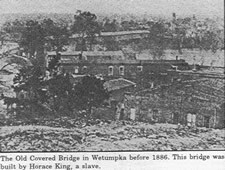 The Wetumpka Bridge Company built the 1834 bridge and was authorized to charge a toll for crossing. The toll was a matter of constant dispute among the city’s citizens. This bridge was washed away in a flood in 1844 and – until a new one was built – the bridge company was required to provide transport across the river via ferry or bateau at the same price as the toll fee. A covered bridge erected in 1844 was the next to join the two halves of Wetumpka. It was built under the supervision of a black man, Horace King. Accounts describe this bridge as being rather spooky, especially at night when it was lit only by three widely-spaced lanterns. Even though an 1864 Legislative Act repealed the 1834 Toll Act, causing the toll fees to be lowered; the whole issue of a toll bridge continued to be controversial. The residents of the east bank were afraid their taxes would rise if the county purchased the bridge and removed the toll; while the west bank residents (who paid most of the tolls) felt it was an unfair burden on them. 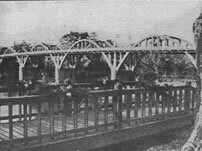 The “Great Flood of 1866” washed away the 1844 bridge, and a new one was built in 1887 by the Southern Bridge Company of Birmingham. The 1887 structure was an iron bridge. After the County Commission threatened to build a “free” bridge over the toll bridge, the Wetumpka Bridge Company was sold to the county for $12,000. The commission made its first payment in February 1908. After nearly three-quarters of a century of toll bridges crossing the Coosa at Wetumpka, the bridge was declared free. By 1927, the iron bridge was in need of extensive and costly maintenance. The Commissioners of the time thought it would be more expedient to build a new one than effect repairs. Alabama’s Governor Graves wanted the new bridge to be of steel, while the Commissioners were equally insistent it should be of concrete. Governor Graves eventually agreed that concrete would be used in the structure. The estimated cost of the bridge was $177,400, and an agreement was made between the state and the county to share equally in the expense. The county was to be responsible for $88,700. Previously Alabama Power Company had given the county $75,000, the interest on which was to be used for the maintenance of the Martin Lake Bridge. The county asked the Sate Highway Department to assume the responsibility for the upkeep of that bridge, and upon their agreement the $75,000 was available for the county to apply to the cost of the new bridge. Only $12,700 more remained to be raised by the county to finance construction. After another negotiation with the Alabama Power Company, arrangements were made by which this amount could be paid. The Bibb Graves Memorial Bridge was completed in 1931. It was designed by Edward Houk, who was the State Bridge Engineer at that time; and named after Governor Bibb Graves. The structure is the only bridge south of the Mason-Dixon Line which is suspended by reinforced concrete arches. It is considered eligible for the National Register by the Alabama Historical Commission and the Alabama Department of Transportation. Wetumpka’s Bibb Graves Bridge is the most unique landmark in the city. It has become and emblem used in connection with most local organizations and events and any depiction of it brings Wetumpka immediately to mind.